Shopping for Masters of the Universe Action Figures? Relive all the exciting action of Masters of the Universe! Skeletor, the Evil Lord of Destruction, and his henchmen face off against He-Man, the Most Powerful Man in the Universe. The famous foes are reimagined as 1970s-era 3 3/4-inch action figures, with a "what if?" alternate history of the series. 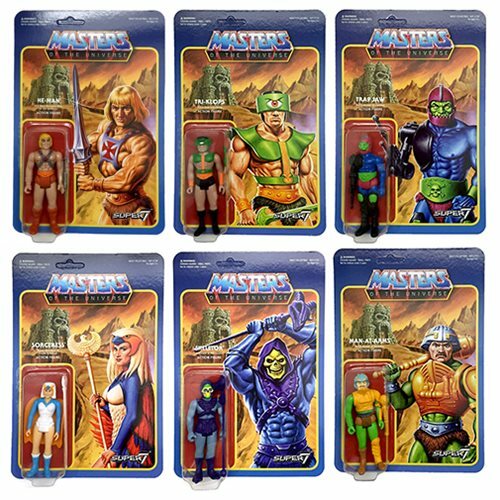 The retro-inspired Masters of the Universe action figure line is authentically crafted to the finest detail. Each character in series 2 is hand-sculpted by the head of the Kenner sculpting department from the 1970s-1980s to match the feel of action figures from the golden age, and packaged on a traditional blister card with peg-holes in the bottom of the feet and accessory taped to the inside of the bubble.